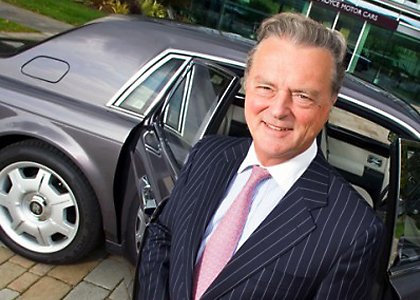 Tom Purves was CEO at Rolls-Royce Motor Cars from 2008-10. Previously, he served as the Chairman and CEO of BMW for North America from 1999 to 2008. He was also Chairman and Regional Manager for the Americas. Tom’s extensive sales background, which includes successfully leading multi country sales operations to increase revenue in an international and competitive climate. He has led famous global brands to post significant profits through periods of substantial economic grown and deep recession, exceeding corporate expectations time and again. From 1999 to 2008, BMW sales in the USA grew 96% from 154,968 to 303,190 of which Mini sales grew from 0 to 54,000 in 7 years. In Canada, Mexico and Latin America, sales grew fourfold. Tom’s notable innovations included the early use of sales promotions through event marketing and wholesales sales incentives in Saudi Arabia and the Gulf in the mid to late 70s. He also introduced live business TV by satellite at BMW in the 80s. He was the first person in the automotive industry to use internet communications on a substantially creative scale. Earlier in his career, Tom was Managing Director, BMW (GB) and Sales Director for the Rover Group. He has repeated success in guiding sizeable, cross functional teams in the preparation and launch of new products, achieving record sales. He has created innovative marketing strategies and identified profitable new markets for growth and expansion. Tom is an expert negotiator and ambassador able to forge solid professional relationships with strategic partners and build consensus across multiple organisational levels. In 2011 he became Visiting Professor of Management Practice at Canterbury and Christchurch University in Kent, and works with the careers department and the Business School at the University of Glasgow. He has vast experience both about the automobile industry and management, and is keen to share his experiences with others.